Most days are filled with a general scrambling-like feeling. Besides managing the details of our project, I’m managing details on two other intense construction projects (both nearing completion, which is when it begins to feel like a marathon). 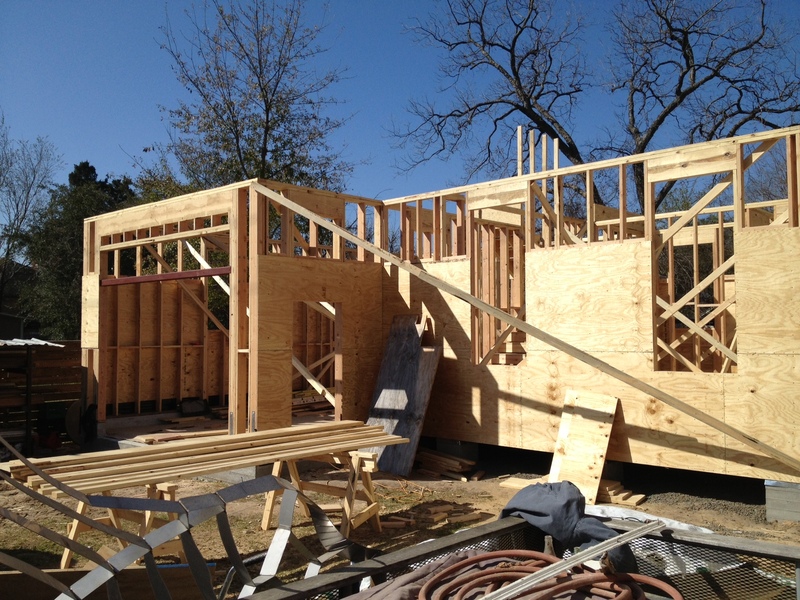 I really enjoy this stage of construction, because it’s when all the scrutiny during design, and then foundations and framing, reveals itself to have been very much worth the time and effort. It’s never without hitches though, but a job well done is when those hitches are at minimum. And I like seeing what I’ve been imagining all this time. The way the light falls down from the window in the stairwell. It couldn’t be a more perfect way to add that western sun that I love so much, without overheating my room. 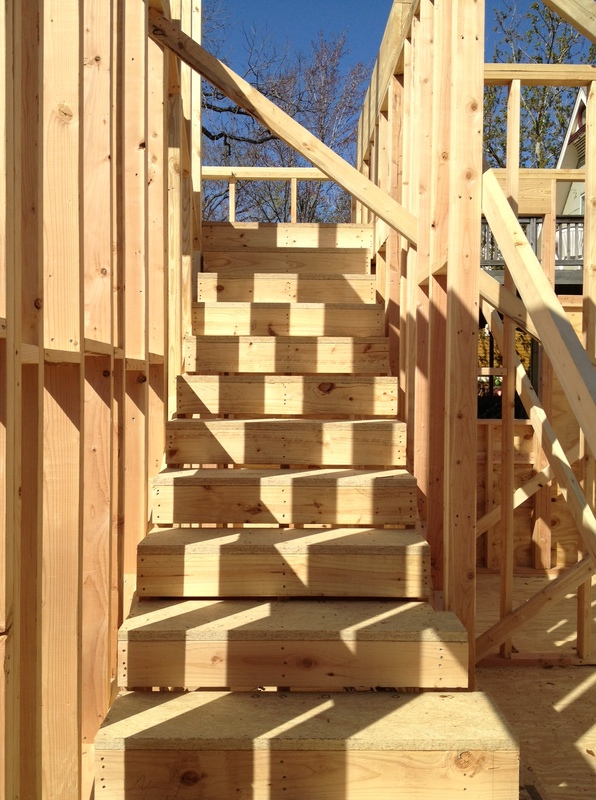 And just the way the space unfolds up the stairs. I think it’ll be great. What I’m really here to say though, is that I love having a construction project in my back yard for the simple reason that I don’t have to consult books, or the internet, for detailed dimensions, or investigating how two things come together. I can go out my back door and see for myself. Really handy. In fact, our contractor was showing off our house (when he could have been showing his own gorgeous house) to some other design professionals looking for examples. That’s happened more than once, another neighbor designing his parent’s house in our neighborhood, stopping by to check things out. Lots of times the details go unnoticed, and in the end most people respond to the overall look of a place. In this case, we have people on the journey with us, experiencing it along the way and learning a few things too. I like being able to share this way. Well that was basically the worst task I’ve performed so far in the making of this addition. Preparing for the insulation crew coming tomorrow by vacuuming the cavities at the exterior wall, so that they don’t trap a lot of dust and debris in the space. Locking it forever in the wall and, in my opinion, leaving some really good nesting materials for critters large and small. Not that we have anything like that here in Texas. The roaches are only 2-4 inches long, at most. But, it’s done. No more complaining. 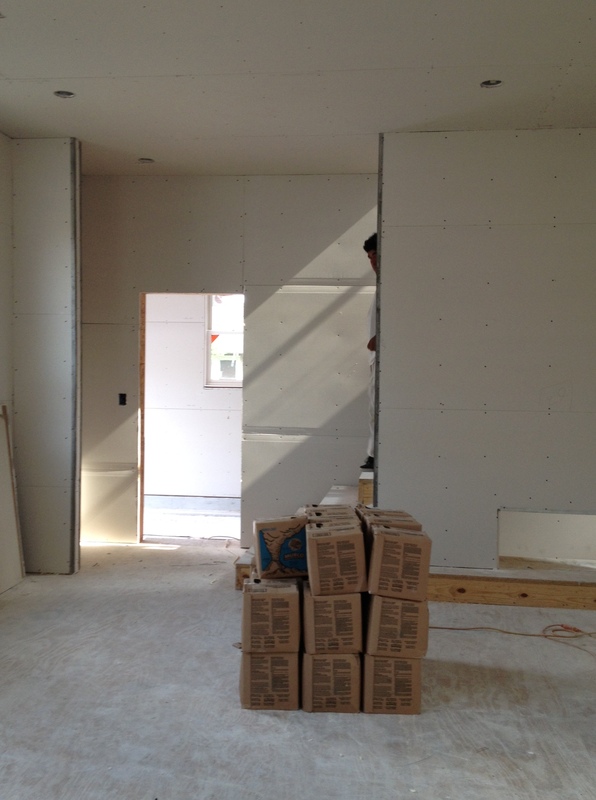 Over the din of the shop vac, I was announcing that once the insulation went in, we wouldn’t be able to see through the walls like we can now, enjoying the sunlight filtering through the open wall studs. 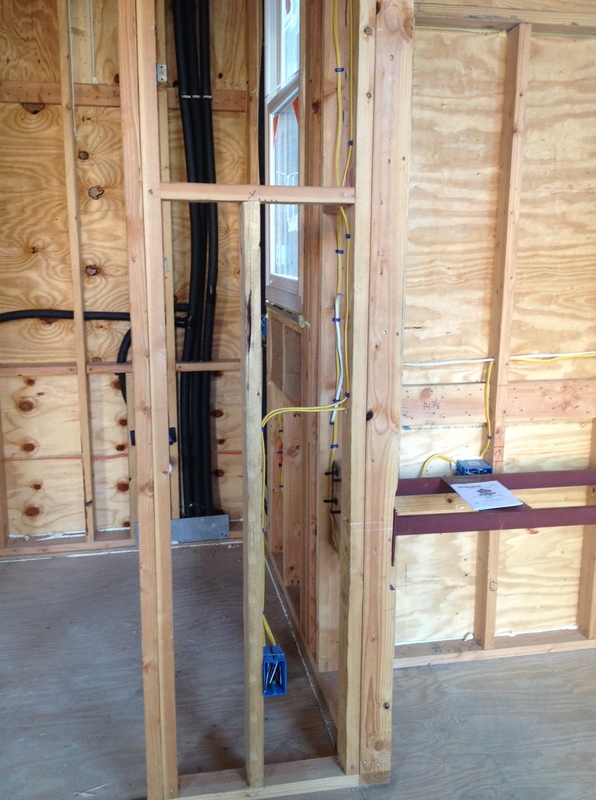 What I realized was that the insulation won’t prevent us from seeing through the interior walls, we aren’t insulating the interior walls. 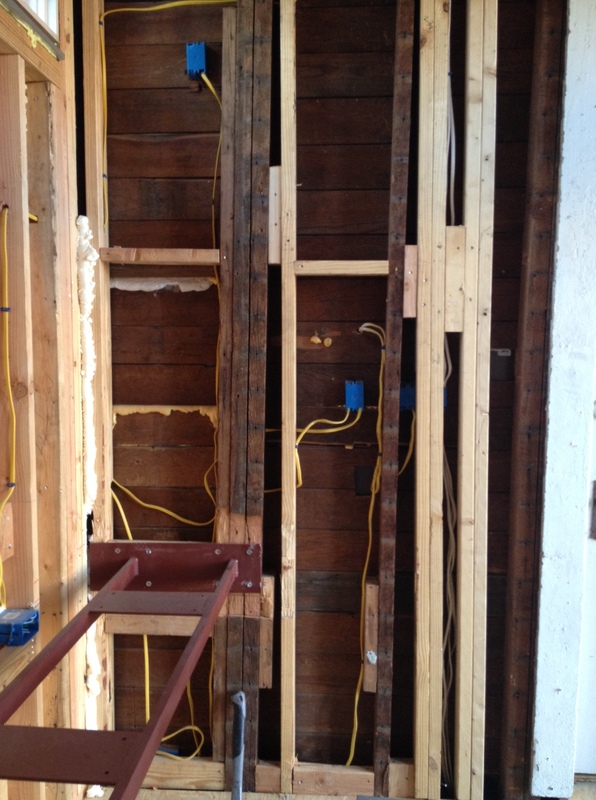 I also realized that I was forgetting to document all the guts in the walls, that were about to be encapsulated by fiberglass insulation and shortly thereafter, sheetrock. 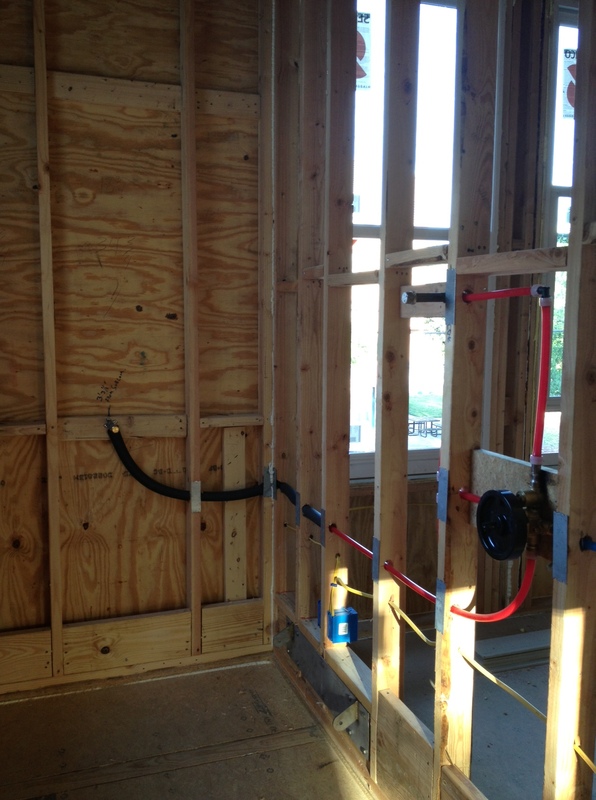 For our clients, we typically photograph the walls before they get covered up so that in the future should the need arise, we might be able to tell where exactly the pipe runs, or which direction the electrical wiring goes. 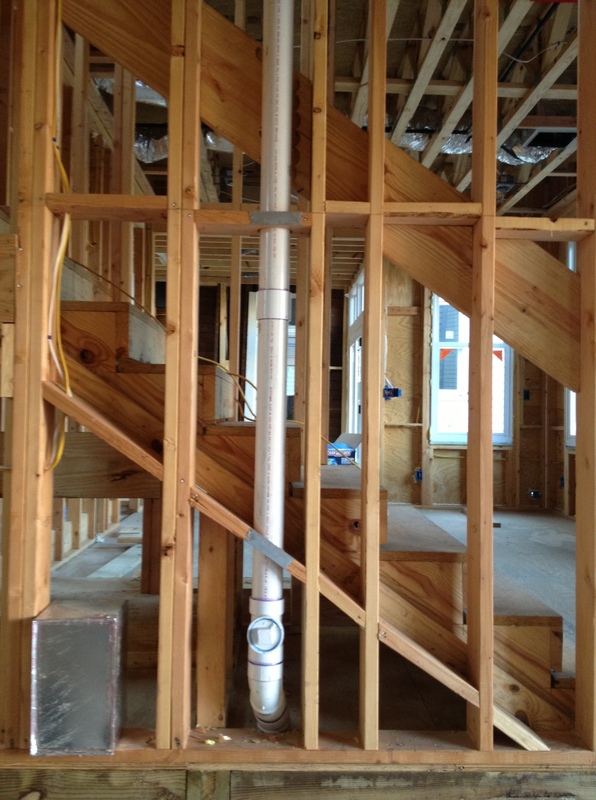 The good part about construction slowing down a little bit to allow me to make all the various selections that have to be made, is that we’ve started to enjoy certain aspects of the house, even unfinished. Although I can see through the interior walls a few more days, I can tell the quality of light in each room, and know which one I like best so far. I can say with certainty that it’s not mine, but no matter. I’ll probably hole up in the best room from time to time anyway. Late last week, when neighbors wandered over for a tour, we stood in the garage looking out over the landscape, beers in hand, and I envisioned those lazy summer evenings doing just that, out of the sun, backing into the cool of the garage, folding lawnchairs beneath us. I suppose this is a Michigan thing, I don’t recall people relaxing like this here. And now that I think about it, I did get some satisfaction from cleaning my new house for the first time. As tedious as it was, it’s the same kind of feeling I used to get when I had the summer job cleaning rooms at the bed and breakfast. There, I walked into a mess, and left it pristine. While I didn’t achieve perfection tonight, my effort wasn’t wasted, I know. The quiet, thoughtful framers left recently, and are essentially finished with their work. I feel like there should have been a more momentous “good bye!”, but alas, I waved from the front door as they drove off and mouthed again “thank you”. I should be happy that they are finished and that we can move on to all the things that follow, but those things that follow are messy, complicated, and consuming. The air conditioning crew has been working, as well as the electricians. It took two hours for us to “hang” the mid-century Danish mirror we found in Michigan that weighs at least 60 pounds, in order to locate the sconces around it. 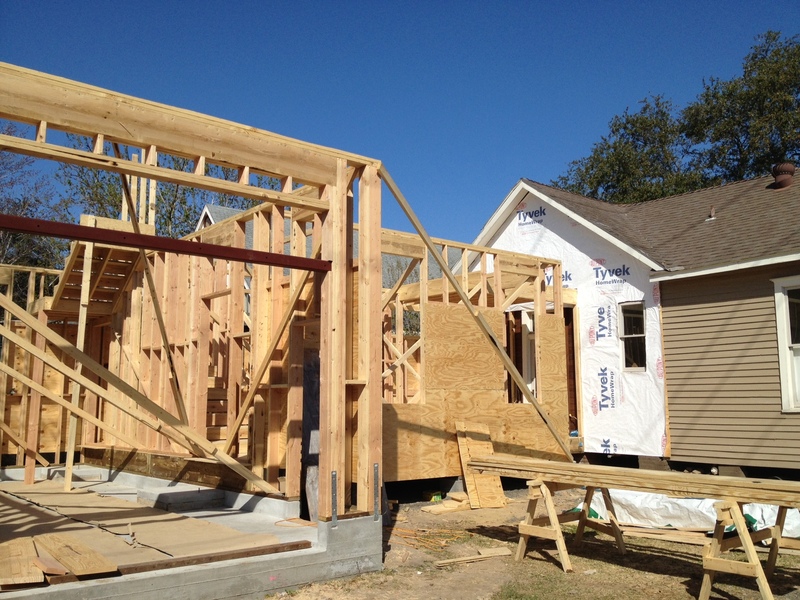 But it does feel good to focus on shopping for all the items we will install in the house, now that the structure is set and complete. It has been a whirlwind of decisions and yet… many of the items we’ve been selecting have been on our wish lists for years. Maybe we specified an item for another project, or maybe we’ve seen it used in other houses, and just wanted it. 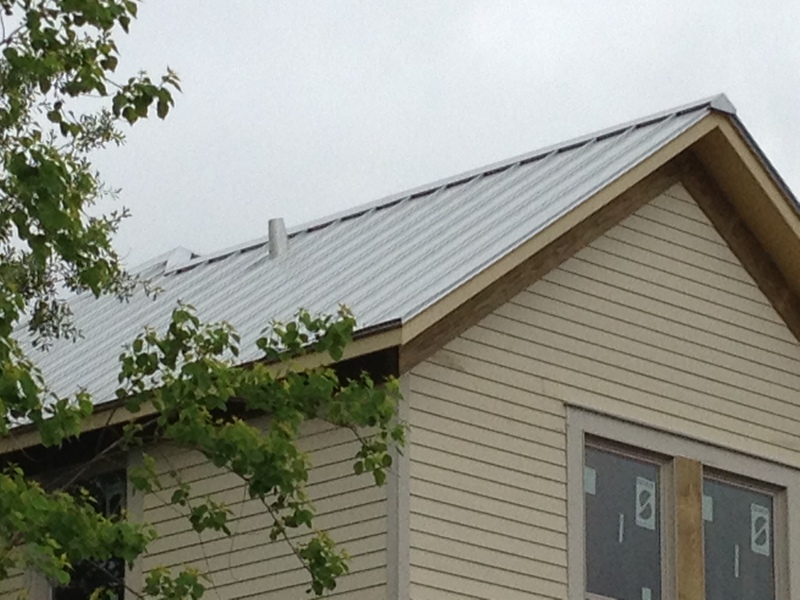 Like the metal roof, for example. 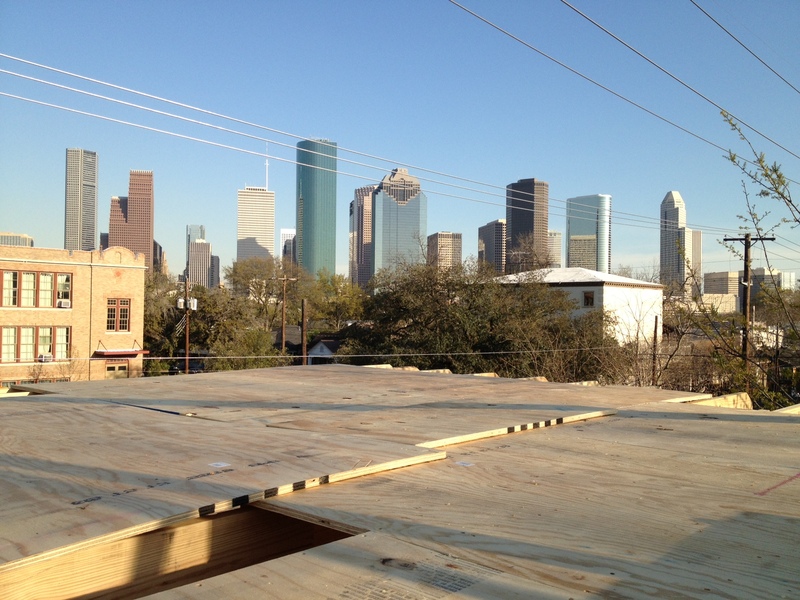 Historically, it’s not an uncommon kind of roof to have in this neighborhood. Typically though, it was a corrugated metal roof, sometimes painted, and held up well against the wind and rain that comes in torrents some times of each year. We elected to use a slightly different version that has become more popular lately, that will hold up also against falling tree limbs (we hope not to have any more big ones like the neighbor’s pecan fallen during Hurricane Ike), and reflective of the hot sun. And the gorgeous, simple details that come along with it give it an almost rural feel. More akin to when this neighborhood came into existence than the bustling 4th largest city in the US that it is today. There are always a list of items that hang around in our consciousness for someday when we are… that appeal to our senses, our sense of design, have some nagging right-ness with our aesthetic. And that short list doesn’t often change. Once something makes it on to the list, it’s on there for life. It’s a coveted item, not just a passing fad or fancy. I notice that right now a deep, rich, blue velvet sofa is appearing in magazines, but that item has been on my list for some years now, and I’m hoping I can incorporate that finally into my life. Other things are on my husband’s list that I’m happy to include. Like the light fixture that he’s wanted since a client bought one from Denmark a few years back for their stairwell. 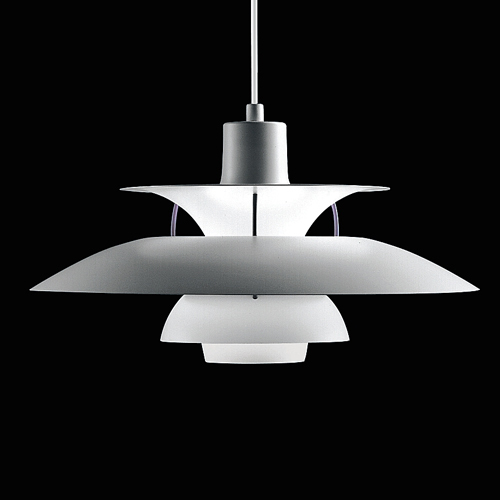 Our 1958 original PH5 is now on it’s way across the ocean via ebay, to hang in our stairwell, sculpturally lighting our way to bed every night. I hope it’s magical. 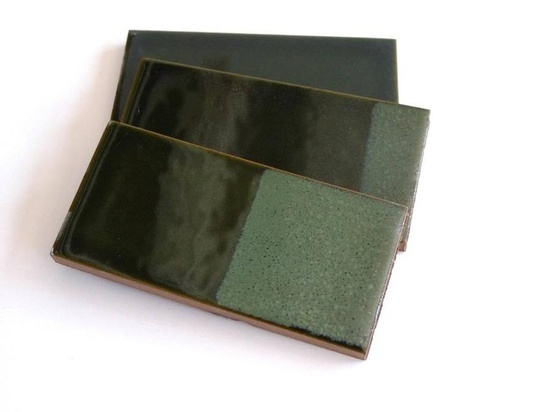 I collect Heath ceramics for everyday dining, but have loved the tiles for quite some time. We purchased some tile for a kitchen backsplash and then decided to save it for later. Well later has finally come, and I’m excited to find a home for it in our bathroom. It’ll give a rich quality to a room that likely will be mostly white, and I’m eager to start searching for a complementary stone to enhance it’s beauty. What I’ve learned over the years that contributes greatly to ensuring the longevity of the investment in your home, is to buy what you love. Surrounding yourself with things that make you happy is not a new idea by any means. Rather than choosing items that are ill considered, are cheaply made, or ubiquitous in design of the moment, take some time to select items that really speak to you. Be honest about what those things are. That’s not to say that the item has to have a long history, there is plenty of great work being designed and produced now, from people with skill and consideration. And while it’s exciting to be a part of something fresh and new, it’s equally as exciting to me to be a part of a rich tradition that is authentic and real. One particularly pleasant afternoon recently (this is Texas, after all), our daughter spent some time out in the addition, and she happened upon one of the framer’s rectangular pencils sharpened with a knife. What I found later were her cryptic communications with the “workers” whom she sees mostly on Saturdays. Surprise, she said. She had actually created a series of arrows pointing different directions, directing them to her messages of support. She is in kindergarten, and apparently her sweet teacher thinks that positive encouragement is the best way to high achievement. I don’t disagree. Good luck, she says. I’m pleased that she wants them to do a good job. Somehow I think she translates their good work into our eventual pleasure. We’ve been admiring how pure the space looks when that’s all it is, space. A supposed roof over our heads, the suggestion of windows. We’d love to invite friends to share it with us, with magical twinkling lights hung from the ceiling joists, and tasty drinks and snacks. 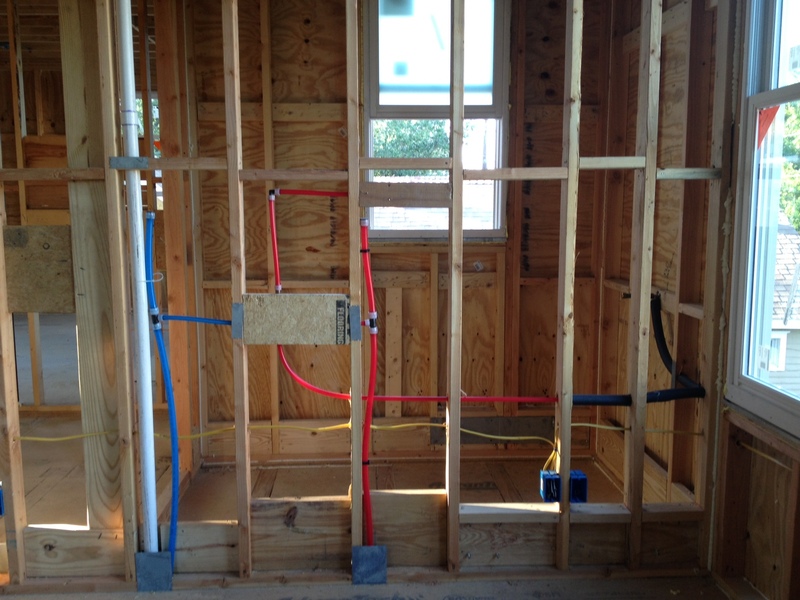 Before it starts getting muddled by what I call the “guts”, the ducts, wiring and plumbing. 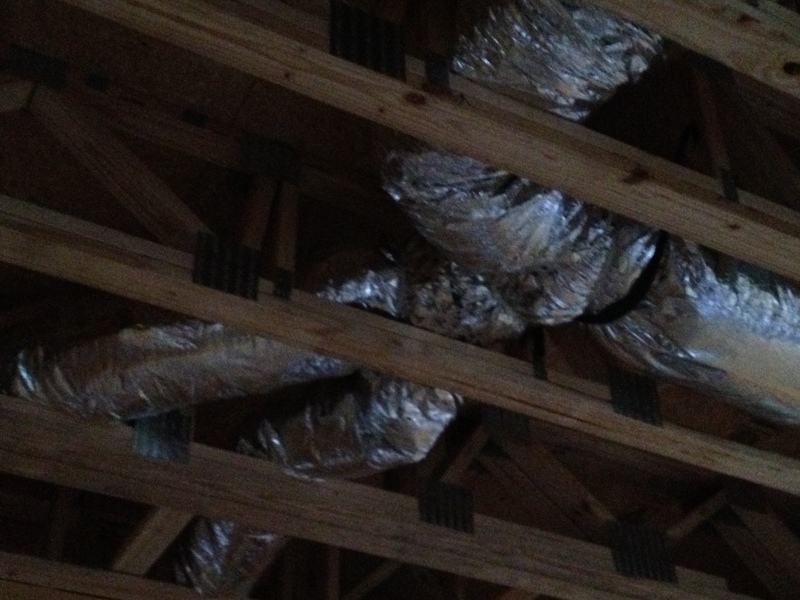 But it changes too rapidly and already the ducts are being installed for the kids to fear as “snakes” in the attic. Did I say that? Because somehow the little guy knows that’s what they are. PSS, I love it!, she exclaims. Meanwhile, little brother is doing what he does best, which is to explore, throw scraps of wood and my beloved Heath salad plate from the upstairs windows, and climbing. 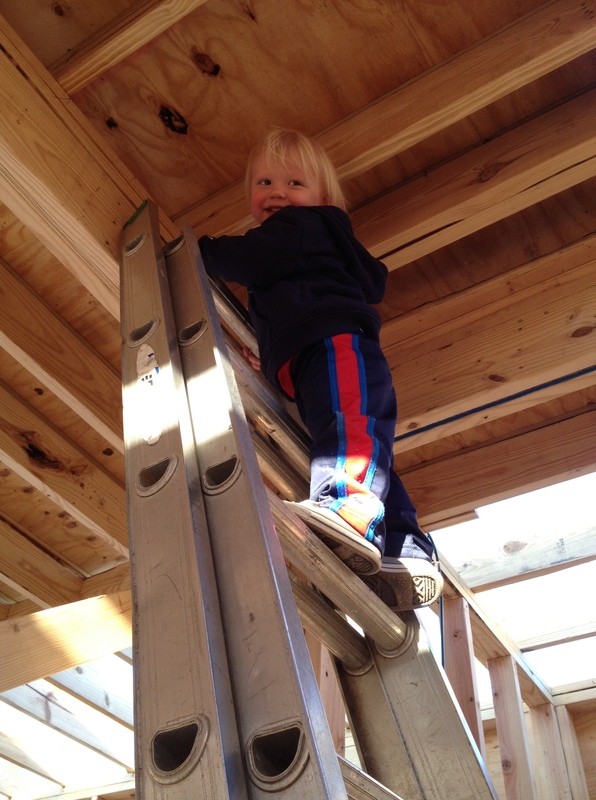 We had to relocate the ladder left up to the attic because he easily would have ventured out on the open attic deck. There were no rafters up there at the time. I do fear us all making it through this process in one piece. 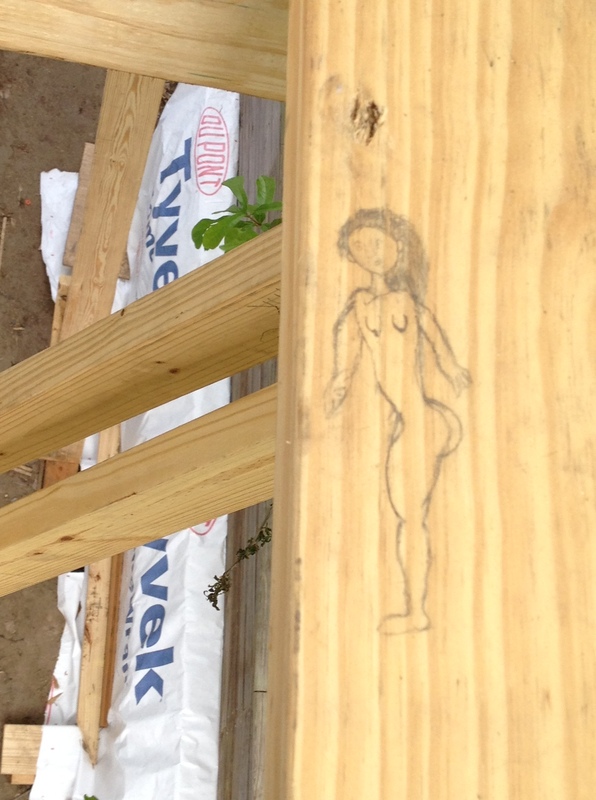 Now her markings are atypical of construction sites. Most often you see field sketches, details, notes for the door specifications, numbers and calculations. As the addition continues to be built of sticks, yes we’re those piggies, we embark on the decision making process that is constant throughout construction. Making selections of every product and material that will be installed in the house. 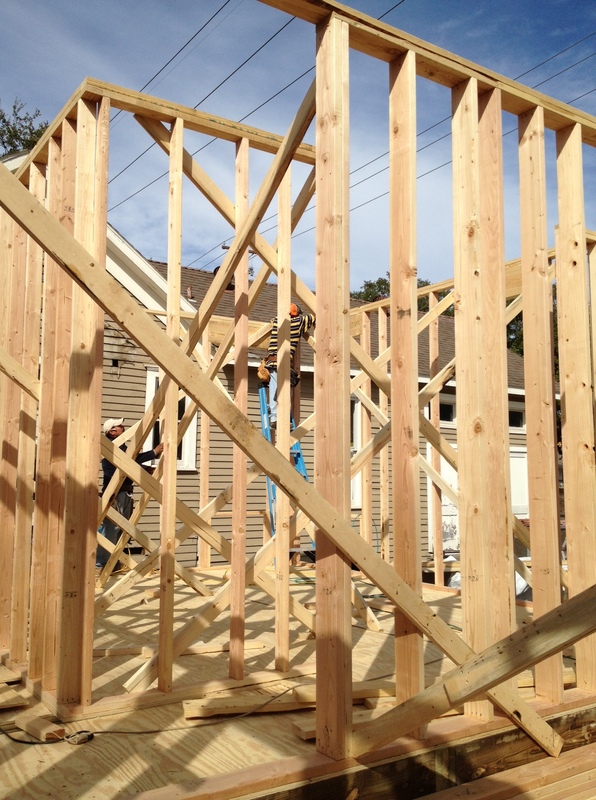 We sat down recently with our contractor, and compared cost spreadsheets. We’ve established our contract as a “cost-plus” arrangement. 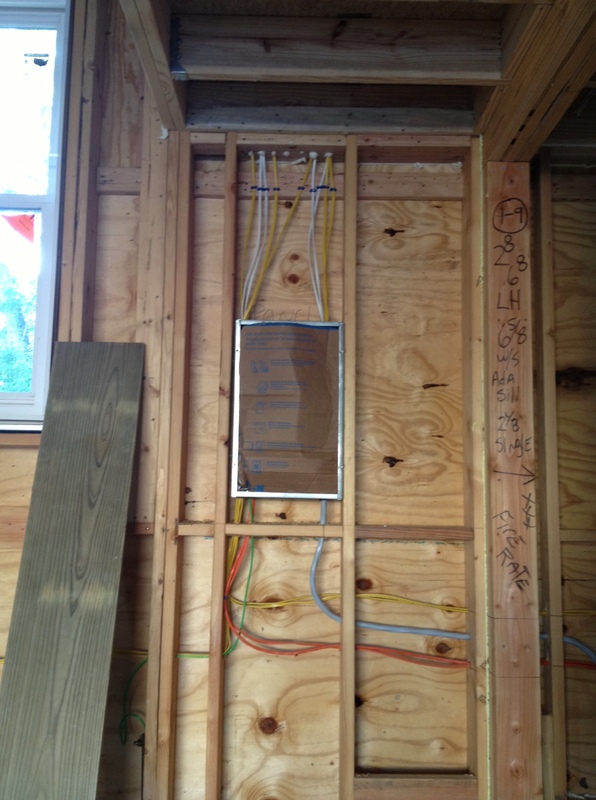 This means that we’re privy to every bid from each subcontractor, and evaluate it based on a control budget/ estimate. 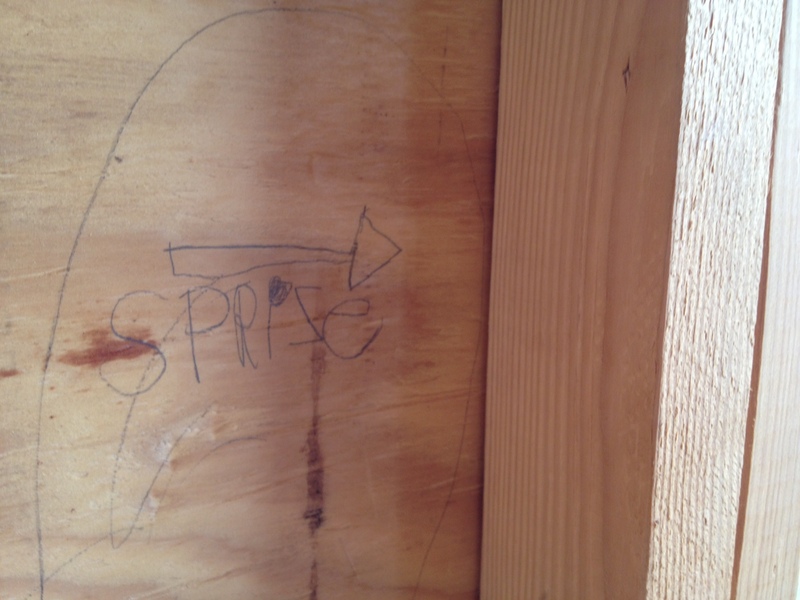 Then, the contractor adds his percentage fee on top. This is a great way to feel like we have some control over the construction budget as we go. At each step we review the bids, and can solicit another bid if we think we can save money on a particular trade. Or, more easily for us, can save money on a particular product. As a designer with trade discounts, I’ll likely be buying tile, faucets, lighting, and hardware directly from sources that I work with often. For every project I prepare what I call “schedules” that identify every product or material that needs to be selected. Within my spreadsheet I attach a budget to each item as well as keep tabs on the total. By doing this, I’m able to quickly identify whether splurging on a $1000 blue faucet in a pool lavatory will be possible by offsetting the cost with other budget minded items. Maintaining the established budget is important for my clients. These days there aren’t often vast reserves to be tapped when the construction goes way over budget. This is true for us as well. So when we stand up in the attic and look out toward the tree, we start to think about adding a window, and how we will use this storage space. And if there is some way to capture this unobstructed view? We’ve always loved the view but haven’t felt inclined to make a huge deal about seeing it through large expanses of glass. When I moved from NYC this neighborhood was appealing because I felt like I was somewhere by orienting myself to downtown. So, we’ve decided to expand the boundaries of the storage space in the attic, but not go so far to make it livable space. We have to draw the dollar sign somewhere… And for the moment we are comfortable with the projected bottom line, but it is something we need to be aware of almost daily. Each decision has cost implications and for the hands-on set as we are, this is a perfect way of ensuring that we end up exactly where we thought we would be. I’ve spent so much time inside the addition, that I forgot to step back and look at the outside. At how it relates to the old house, and to the streetscape and context. These things are very important, especially in the historic district we’re in. But I got so excited to start mentally occupying the space that I just plain forgot. Well, it doesn’t look so bad from afar. Not that I stepped outside of the yard. I drive by slowly when I’m racing off to another jobsite meeting, and gawk. In the evening when the gaggle of boot camp attendees are jogging by, I’m astonished that they don’t stop in their tracks and stare at the construction. I guess they aren’t interested in the built environment when wiping that much sweat from their eyes. I can’t not stop to stare, but I suppose that’s how I got into design in the first place. An overabundance of interest in the built environment. But the logistics are, that the garage is shown on the left. It is a work-play-park space, with a finished concrete floor, operable windows, and a gorgeous stainless steel kitchen that was salvaged from an executive office. We won’t install the dishwasher (now that would be overkill), but it’ll have a sink and small refrigerator. We may replace the cooktop with a gumbo pot burner. Or maybe it could be a lobster pot burner. It’ll be a space where we can take refuge from the heat in the summer, without retreating to the full A/C of indoors. And to detract from the big garage door, we added transom windows above which give us a different view to downtown as well as more light. The panorama function on the Iphone is fun, but it really distorts the view, or perhaps it’s because I wiggle the phone too much while taking it. Either way, it gives a little more information on the overall. Including the official “potty”. 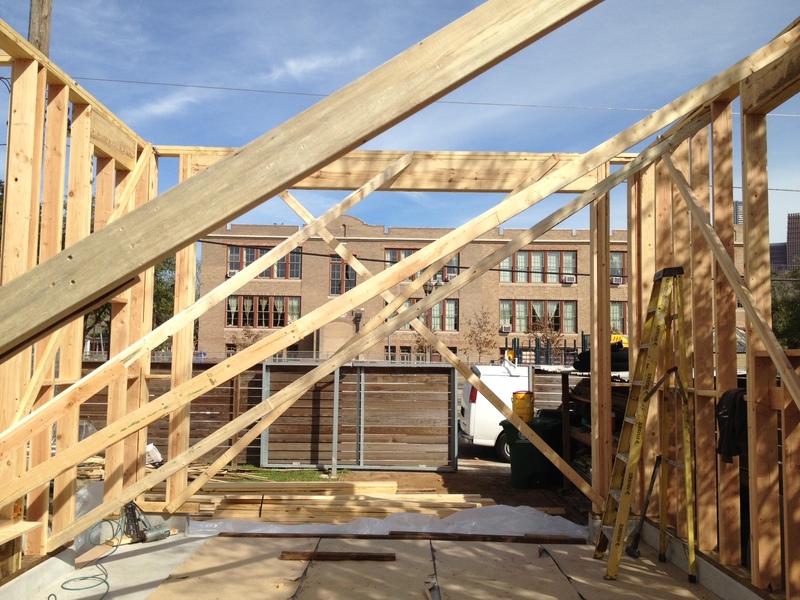 Despite the fact that the trusses are a few days away, the framing crew is continuing to work. The stairs currently lead to nowhere, but have some beautiful shadows falling on them. We’ll keep the kids out for now. 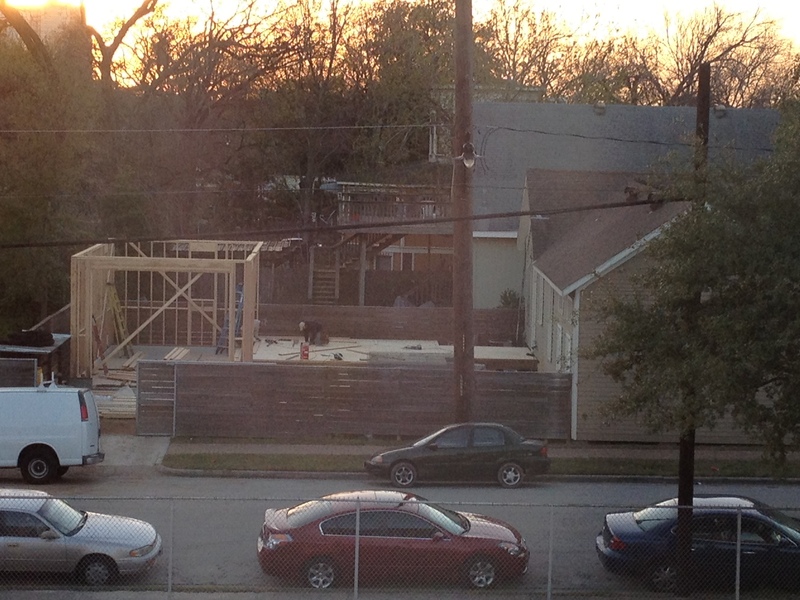 Over the last several days, there has been a lot of noise in the yard, hammering and sawing. The framing crew itself, however, is quiet. No music, resting quietly after lunch in the shade. I’m enjoying the sounds of progress, it’s not yet an intrusion on my day. Reflecting back over the work that’s been done, I’ve been reminded of the Eric Carle story, The Very Busy Spider, which we’re reading a lot right now. In it, a spider gets blown across a yard and alights upon a fence to spin her web. 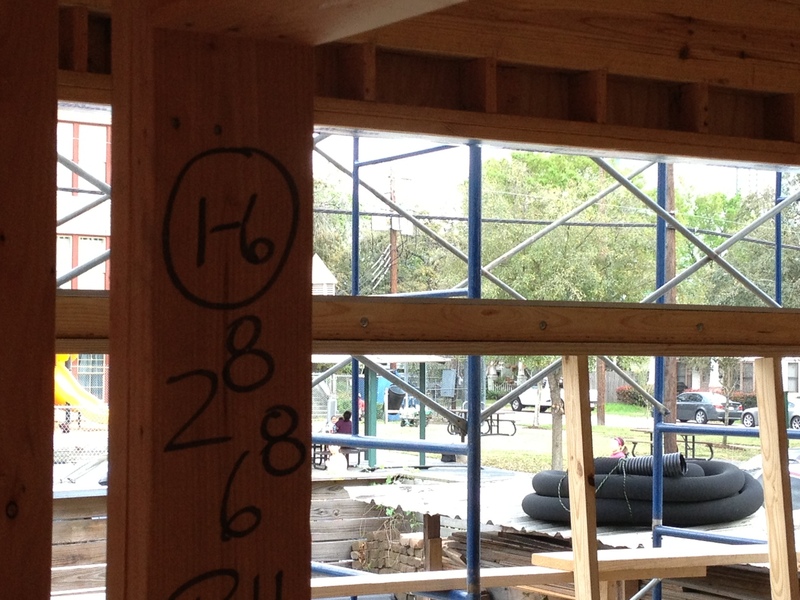 From the second story window in the school across the street, I can see a nice framework for a web. Despite the attempted interruptions of various farm animals, the spider keeps to herself, slowly building her web without wavering from her task. 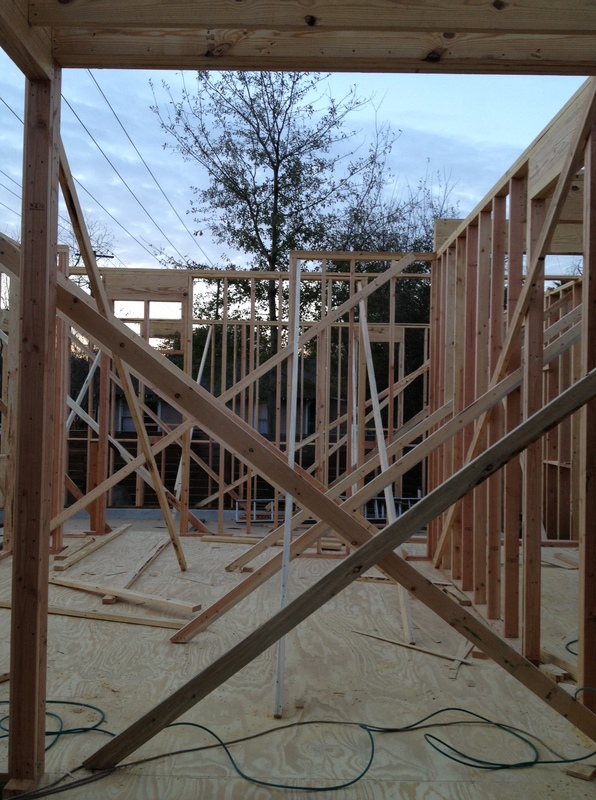 The framing crew is much like this, in that they begin at 7am every morning, and by 8:15 they’ve made significant progress. I appreciate that they have taken our drawings, our only communication about this house, and have assimilated them such that they don’t have to wonder, question, what they are supposed to do. 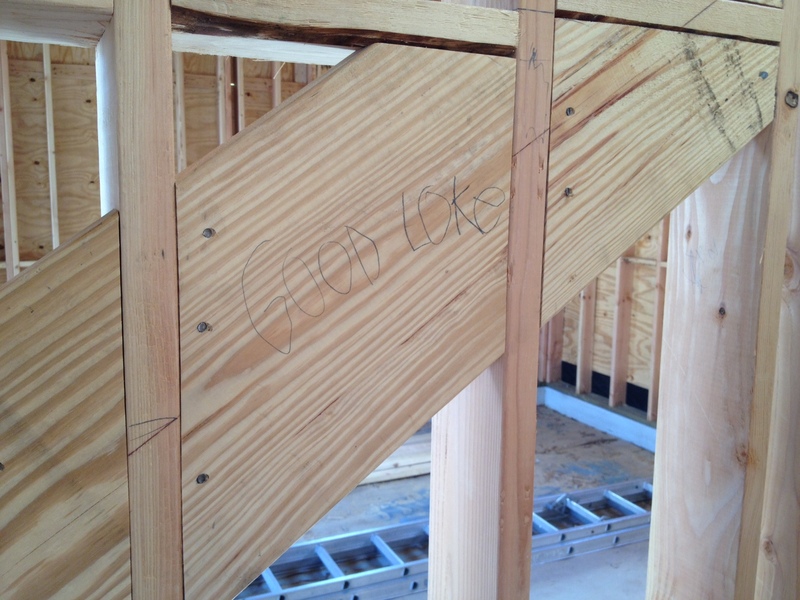 We are lucky to have great communication between us, our contractor Brett, and the framing crew. 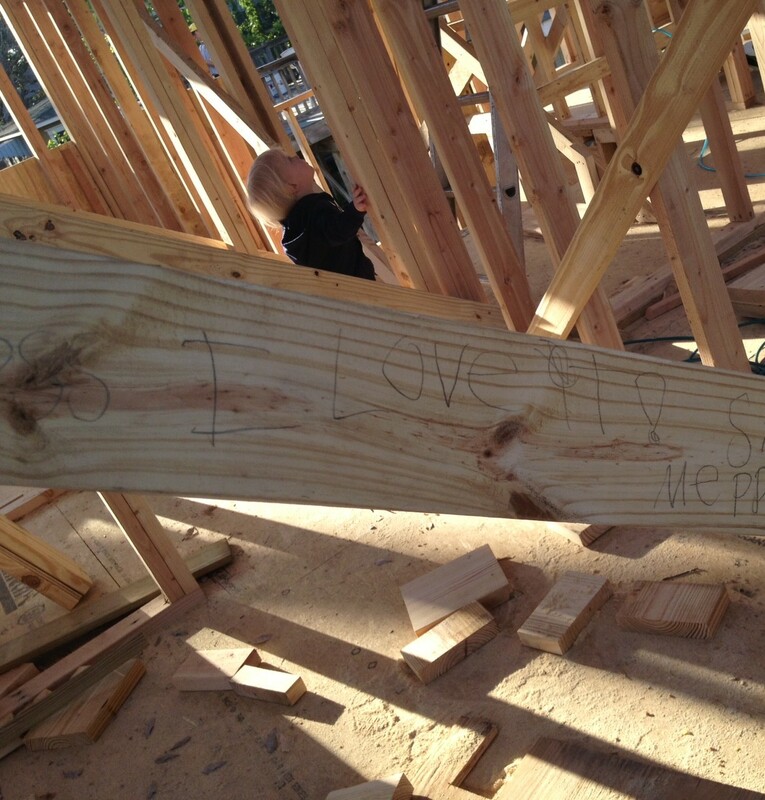 This is probably the most important relationship we’ll have during this construction process. 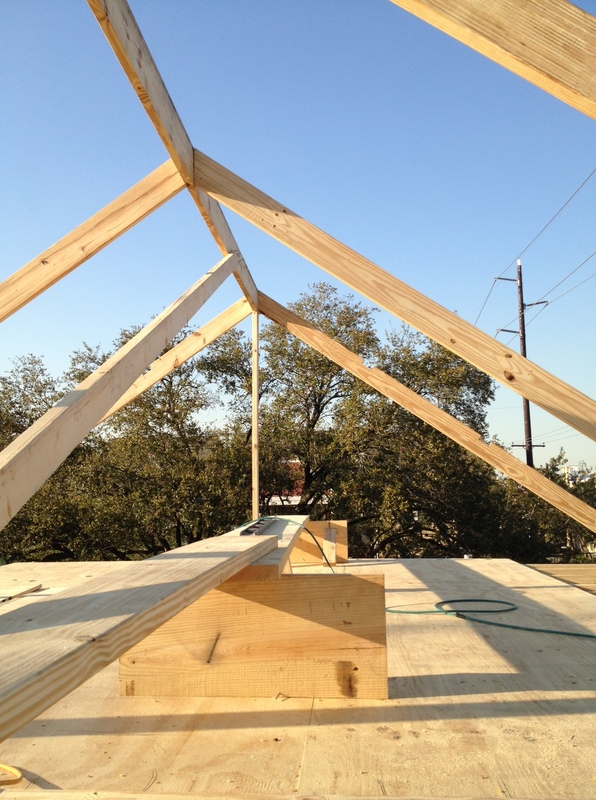 Having a precise web-building crew will help ensure the other trades an easier job later. Despite the busy nature of a web, it is dependent upon a solid framework. As I spend time in our webbed structure, I am slowly learning what it will be like to be there. 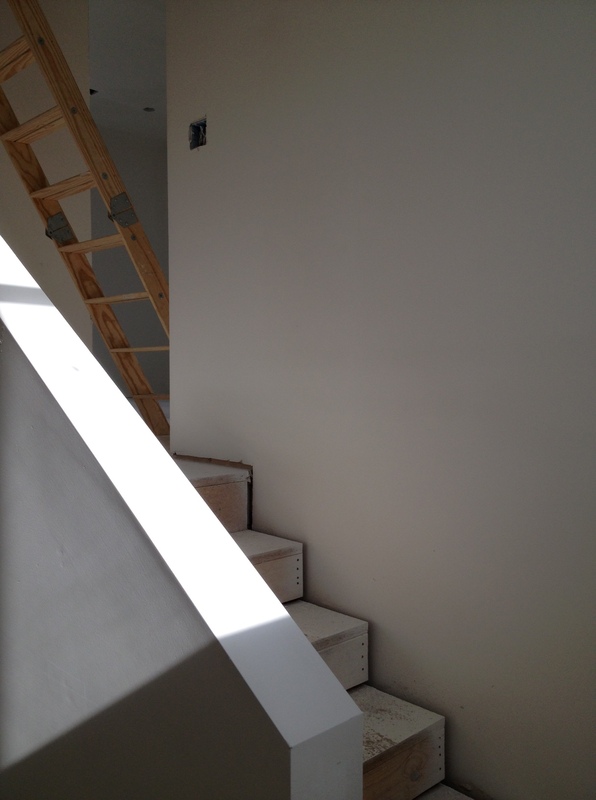 It is an important part of the construction process, spending time within the new space, standing looking at the light and the view. Seeing the spaces unfold and build upon each other. Squatting in mock-tv watching stance from the new invisible sectional. Showing the kids where to use the potty when in a hurry. Designating the spot where we will put our shoes when we come in from outside. For a client who is spending their construction year out of the country, I am blogging for them privately, so that they may have a record of the progress both visual and verbal. I realized as I began writing about their new space, that the important lesson I was trying to convey was the sense of experiencing the house before it is complete. As it’s being built, I’m trying to give them the understanding of their space as if they had been here slowly building their web.